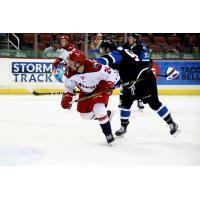 Wichita, Kansas - The Allen Americans, ECHL affiliate of the Minnesota Wild, completed the weekend sweep of the Wichita Thunder on Sunday afternoon with an 8-3 win at Intrust Bank Arena. The Americans exploded for five goals in the first period and added three more in the second. Mitch Maloney scored two goals for Allen in the win. Maloney had four goals in three games against Wichita this weekend. Braylon Shmyr and Dante Salituro each had three-point games for the Americans. Zach Pochiro scored his team-leading 22nd goal of the year. "We took it to them early," said Americans forward Zach Pochiro. "Our team is playing with a ton of confidence right now and we're finally seeing the results. The Americans went 4 for 7 with the man-advantage while Wichita went 0 for 4. CJ Motte won all three games this weekend stopping 13 of 14 shots he faced on Sunday. Motte was rested in the third period as backup Kyle Hayton stopped 13 of 15 shots fired his way. The Americans will resume the road swing on Wednesday night in Idaho. Allen has scored 19 goals in their last three games.